Finca Exotica takes pride in serving you family style fresh and organic food from our scenic overlook, Casa Grande. Our delicious and healthy food is considered by many as “the best food eaten in Costa Rica” as quoted by main chef Tory from L’Etoile fine dining restaurant in Madison Wisconsin. Thefood here is prepared with the finest ingredients by Local Ticos and your host Markus who takes years of experience catering in Europe to bring you exotic flavors inspired by Asian, Mexican, Mediterranean, and Indian influences. The majority of the ingredients (like spring water, chili peppers, curry leaves, basil, ginger, curcuma, coconuts, lemongrass, pineapples, fruits, vegetables, salads, eggs, milk for homemade yogurt, black beans, fish, poultry or pork) are either harvested on the same day right here on our permaculture farm or from neighbors or local fishermen. The blend of intense fresh exotic flavors in our healthy food will simply blow you away! Every month brings a new scrumptious organic treat to try fresh from the garden. Our local chefs, Coco, Tomas and Josue each add their own special touch, or spoon as we call it here in Costa Rica, to the mix. As the seasons transition from the dry to green season, the fruit trees bear more and more fruit. In January, and again in March, lovi lovi, a cherry-sized fruit with a sour bite reminiscent of cranberry and grown primarily in Indonesia, Malaysia and Sri Lanka, is transformed into a deep pink fruit juice and jam. From March to April, the branches on our mango trees are weighted down by the juicy yellow-orange fruits. In varying months miracle fruit dazzles guests on the garden tour with its ability to transform the normally sour star fruit into a sweet treat and jack fruit – the largest fruit in the world, which can get up to 70 pounds – delights guests in the form of ice cream, cakes and smoothies. In June we savor the delectable mangosteen, guanabana (sour sop), , yellow, orange and green lemons, velvet zapotes, and Surinam cherries. All year round we have noni, 7+ delectable varieties of bananas and star fruit to round out the tropical flavors in the fresh fruit juices, adorned breakfast plates and jams on the table. Not only the fruits make it into the culinary extravaganza here: fresh ginger, kaffir lime leaves, galangal, lemongrass, coconuts (in oil, milk, shredded and water) and turmeric from the garden ensure that everything you bite into is packed full of fresh detoxifying ingredients. Our restaurant’s chefs draw from what they have at their fingertips to create a fusion of Ayurvedic, Indian, Thai, Tico and international cuisine using traditional cooking techniques as well as putting into play a tandoori oven, coconut shredder using a chopped off machete and wood grill. 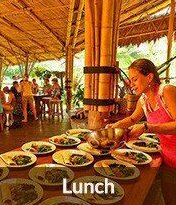 When booked through our website, all meals, Breakfast, Lunch and Dinner, are included in your stay and prepared daily in the best organic food restaurant in Costa Rica: Finca Exotica’s! Through special studies and workshops held on-site, our chefs are well prepared to cater to any dietary restrictions. If you are allergic to certain ingredients, or following a specific diet (gluten-free, vegan, vegetarian…), please let us know and we will tailor our dishes for you. 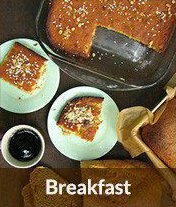 As the sounds transition from night to early morning you may begin to smell coffee brewing, follow the aroma to join us for breakfast in Casa Grande. Our buffet offers a healthy combination of cereals, granola, homemade yogurt, freshly harvested and chopped fruits, without forgetting milk, a strong coffee and healing herbal teas. But wait! keep a bit of room for what our chefs are cooking for you: a colorful plate, making every morning special. Eggs on toast with spicy salsa, fried sweet or green plantains, Frittata, Tortillas with pico de gallo and avocado, Mexican sopes with potatoes and black beans, or the traditional Costa Rican breakfast of Gallo Pinto… Alternatives are endless – but all will delight your palate and prepare you for your daily adventure! Our characteristic conch call can be heard for miles, and it will tell you that a delicious light lunch is being served in the shade of Casa Grande. Our chefs are paying so much attention to details we’re sure you will be amazed when noon comes. Colors, flavors, nutrients and vitamins: we want our plates to be perfect. Every day, we also make a different fruit juice with our garden’s products – really refreshing and perfect to complete the meal, before heading to the beach or chilling out on Casa Grande’s terrace. Imagine a pre-dinner cocktail in the jungle under a starry sky. Here at Finca Exotica we can make that a reality. Our Casa Grande deck area is perfect for catching a shooting star or two while sipping on a cool piña colada, accompanied by a signature ´boca´ snack, which we offer to all of our guests from 6pm onwards. We may have some music playing in the background, or simply just the melody of the Pacific waves, to help you reflect on your day in our tropical paradise. What delightful animals did you catch a glimpse of today? How does your body feel after that soothing massage? What new fruit did you bite into while wandering the gardens? Your evening meal is called by our conch shell around 7pm, which is when you will be led to our communal eating area to take a seat and await the beauty that is dinner at Finca Exotica. Your dinner begins with a starter, usually comprising of a freshly made soup or salad. You will then be served the main course which could be freshly caught fish with quinoa or a tropical coconut green thai curry with perfumed jasmine rice. Every day is different depending on the local availability but the table is never bare of the famous homemade chili sauces, our chefs will never cease to amaze you with their delights! Don´t be afraid to ask for more if you have run out of extras on the table – our chefs understand that this vacation business takes up a lot of energy andwith the food being so delicious, you will of course want more. Chilledspring water is always served with dinner, but don´t forget there is unlimited freshly made juice at the bar area to help yourself to all day every day until you decide you have had enough. Star fruits, Jamaica rose, lemongrass, peppermint watermelon, ginger lemonade, turmeric and sugar cane – don´t be afraid to try, you will love these natural concoctions. Remember to save room for desert….. Before heading off to the beach to look for endangered sea turtles nesting, or quite simply to bed to relax, take time to indulge in one of our signature ´postres´. Whether pineapple flambé, banana chocolate ice cream, jackfruit coconut cake, or cooling chia, coconut, raw sugarcane balls, you will find this the perfect way to end your meal. Maybe you would like an aperitif to accompany your desert? 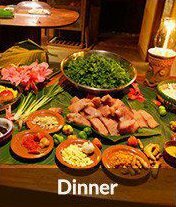 Every evening is different and you will find yourself wondering each day what dinner will be served the upcoming night. Our chefs will be more than happy to share any recipes with you to take home and enjoy with friends and family while sharing stories of your time with us here in Costa Rica.